Basketball is the quintessential team game. All those players that have been honored as MVPs or MOPs certainly couldn’t win games and amass impressive stats without some help. With that in mind, here are our nods to the Best Supporting Player in each classification. Marcus Niblack, Wildwood: While his late three pointer and assist for a buzzer beater to come back from a double-digit deficit propelled the Wildcats to the title game, Niblack has been a key contributor to Wildwood’s success the last two years. Just a sophomore, the 6’0 guard has averaged double-figures both seasons and is more than ready to take his turn “the man” next year for Wildwood. Jeffrey Hernandez, Miami Christian: The 6’4 senior took a big step forward this year in his play. In addition to his ability to knock down shots beyond the arc, Hernandez also showed that he could attack the basket off the dribble and make plays. For a team that didn’t have a great deal of size, he also put in solid work in the rebounding department at both ends of the court. Ronaldo Segu, Orlando Christian Prep: While the 6’0 senor is a D-I recruit, having signed with Buffalo, he still got a bit over-shadowed when compared to his bigger teammates such as senior Nassir Little and juniors C.J. Walker and Kai Jones. Still, it was Segu’s ability to get them the ball at the right time and the right place that allowed the bigs to play big. Segu was also a disruptive force at times when guarding the basketball, forcing turnovers that became highlight reels for teammates. 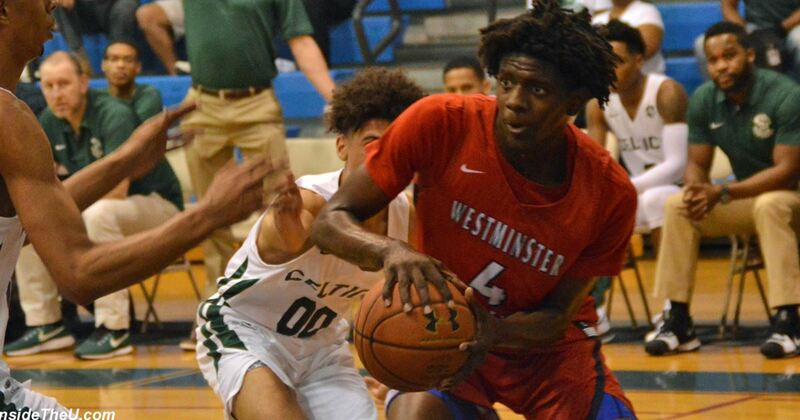 Dudley Blackwell, Fort Lauderdale Westminster Academy: The 6’6 sophomore was arguably the fourth option on an offensively gifted basketball team. However, Blackwell’s rebounding and passing skills created all sorts of opportunities for the Lions. His triple-double in the semi-finals in Lakeland wasn’t a fluke and gave just a glimpse of his talent. Dru Drinnon and Trey Doomes, Plantation U-School: Frontcourt teammates Carey and Barnes got the majority of the publicity and rightfully so, but Drinnon and Doomes worked so well together as a guard tandem that opponents could not simple sit back and clog the lane. Whether it was Drinnon’s subtle all-around skill set or Doomes’ slashing and finishing abilities, one or the other always seemingly made plays to keep the Sharks near the top of the national rankings. Lance Irving, Leesburg: The 6’2 junior had a big game in a one-point semi-final win in Lakeland but he often deferred to senior teammates Graham and Ellis. Still, he came through when needed throughout the season, not just against Booker. His ability to score from all angles and depths make him a tough cover and he’s an active and aggressive defender because you can’t play at Leesburg and not be one. Miguel Ayesa, Hialeah Doral Academy: While rarely the leading scorer for the state champs, Ayesa’s three point shooting loomed large in the opponent’s game plane. This allowed more room for teammates to get good looks and covert. The 6’4 senior is currently unsigned but that will no doubt end soon after the NCAA tournament is over and coaches at all levels realize he is one of the best shooters available anywhere. Josh Scott, Ely: A 6’4 junior with a well-deserved reputation for doing all of the big and little things it takes to win ball games, he exploded in the points department in Ely’s two games in Lakeland. He had 26 points in both the semis and the final, going 8-9 from the floor and 10-12 from the line against St. Pete then 7-7 and 12-14 in the title game. That is just simply incredible. Rob Perry, Oakridge: The 6’4 junior played best when the stakes were highest. In the regional final, he delivered a 30-foot dagger with a minute to play to give the Pioneers a lead it wouldn’t lose to reach Lakeland. In the finals with a pair of top 100 nationally ranked teammates on the bench in foul trouble, all he did was drop 30+ to help win a state title. Yet, he’s been overlooked by opponents and college coaches all season long. That should change sooner rather than later. Michael Devoe, Montverde Academy: Devoe’s move to Montverde proved to be a major positive for both sides. The Eagles got a clutch shooter and a de facto second point guard while Devoe got to raise his national stock as a big contributor to the Eagles’ success. That three pointer from the corner to defeat Findlay Prep in this year’s Montverde Academy Invitational Tournament will long be remembered as one of the biggest shots in that program’s history.